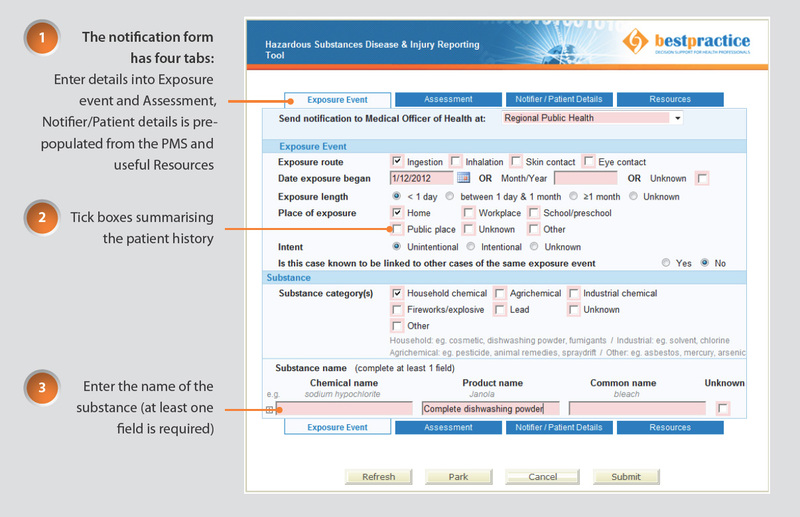 A new electronic notification system has been designed for general practices to report incidents related to exposures to hazardous substances. The system has been developed by bestpractice Decision Support (BPAC Inc) and the Centre for Public Health Research, and is funded by the Ministry of Health. General Practitioners in the Capital and Coast, Hutt Valley and Wairarapa regions are the first in New Zealand to use the system to electronically notify cases of hazardous substance disease and injury, and lead poisoning, seen in primary care. The notification system will be introduced throughout New Zealand in 2013; practices will be notified by their local Medical Officer of Health when the module is available in their area. What is defined as a hazardous substance injury or disease? A hazardous substance is anything that can explode, catch fire, oxidise, corrode or be toxic to humans, as defined in the Hazardous Substances and New Organisms Act 1996. The Act requires medical practitioners to notify cases of injury or disease caused by exposure to a hazardous substance to the Medical Officer of Health. There are a multitude of possibilities of exposure to hazardous substances, such as: ingestion of cleaning products or cosmetics by children, overdose with agrichemicals, carbon monoxide poisoning, illness caused by exposure to solvents or chlorine, contact dermatitis due to chemicals, a fireworks burn or eye injury and “huffing” (inhaling) of butane. How should a case be notified? If you are in the Wellington, Hutt Valley or Wairarapa regions look for the “Hazardous Substances and Lead notifications” module on the bestpractice Decision Support dashboard (see Figure 1 for an example). Submitting the form will send it to your local Medical Officer of Health via a secure system. Cases of non-occupational lead exposure, in which a patient has a blood lead level ≥0.48 µmol/L, are required to be notified under the Health Act 1956. The electronic form can be used for these notifications. Cases of poisoning arising from chemical contamination of the environment (including from agrichemical spray drift) are also required to be notified under the Health Act 1956, and this can be done via the electronic form. The Medical Officer of Health and Public Health Unit staff will assess the information about the exposure and determine if further follow-up with the patient is required. Primary care notifications allow identification of substances which are causing harm, and can lead to controls being put in place to prevent disease or injury. For example, exposure to lead from deteriorating lead-based paint can be reduced through a range of remedial actions. In another example, regulatory changes have been made to the pH of dishwasher powder following reports of injuries to children (see over page). The notification of hazardous substances injuries and diseases seen in primary care as part of the overall Hazardous Substances Surveillance System, aims to identify strategies that will reduce future morbidity and mortality resulting from exposure to hazardous substances. Bertinelli A, Hamill J, Mahadevan M, Miles F. Serious injuries from dishwasher powder ingestions in small children. J Paed Child Health 2006;42(3):129-33. Safekids New Zealand. Children ingesting dishwashing powder: Update 2007. Safekids NZ; 2007. Available from: www.safekids.org.nz (Accessed Apr, 2013). Environmental Risk Management Authority New Zealand (ERMA NZ). Monitoring Report 2011. Report to the Minister for the Environment: Monitoring the effectiveness of the Hazardous Substances and New Organisms Act 1996. ERMA NZ: Wellington; 2012. Available from: www.epa.govt.nz (Accessed Apr, 2013).